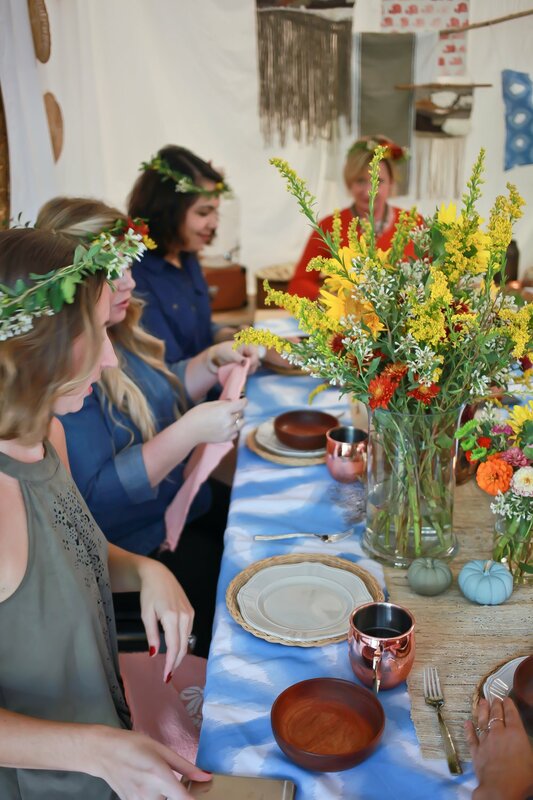 Last month I gathered together with some girlfriends to celebrate the arrival of Autumn with a beautiful brunch. 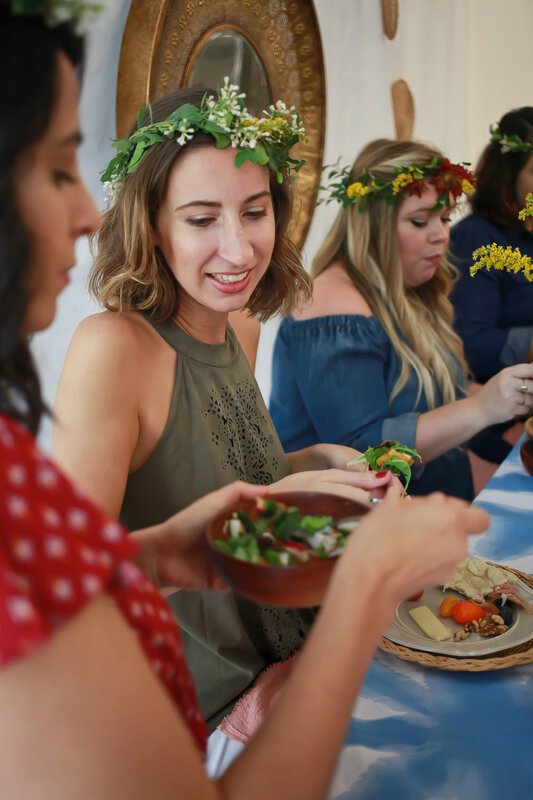 We made flower crowns, enjoyed a nourishing meal and just took a minute to pause and catch-up. Create a beautiful soiree of your own this season using this guide below! Though I've linked where you can purchase items I encourage you to take a look at what you already own and see if you can't re-imagine it. Don't have a table cloth or runner? No worries. Simply use a large fabric remnant or a scarf. Running low on time? Walk out back and trim off some stems or slender branches from your tree and use them as your floral centerpiece. I don't believe that in order for a home (or party) to be beautiful it must be expensive. While I did purchase a few items prior to the gathering such as this woven runner and the table linens, most of the items were ones that were scattered around my home. This combination of old and new is what makes great design great! Nothing says artistic-meets-timeless like layering a woven runner over you table cloth of choice. I love the blonde tones and large weave of this one that I picked up from Target. Let your floral arrangement be the focal point by selecting a simple glass vase. For our autumn brunch we selected an assortment of vases of all different shapes and sizes. Nothing brings a space to life like fresh flowers and greenery. I tend to pick up an assortment from my Trader Joes that I then take home and arrange however think outside the box! See what you have around in your yard or invest in the services of your local florist. I'm all about the contrast with pairing everyday items such as dinner plate with flatware and stemware. The combination of the two provides guests with a sense of comfort and elevation. This rusty, metallic hue is a must for incorporating into your Autumn decor. Though traditionally used to serve Moscow mules in, feel free to serve any cool drink of choice. Make a statement with your serving bowl of choice. Impress your guests with the use of hand-made table linens, taking your table to the next level. With minimal supplies and time needed, this makes for a great weekend project! Nothing beats the way candlelight flickers in mercury glass votives. Having a combination of sizes and shades adds interest and depth to your table. Weave them in among your arrangements just beware of items that may catch on fire!